Image of the High-power coax-to-waveguide transition. 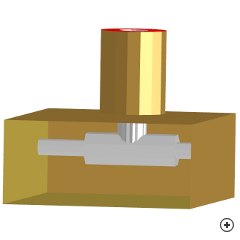 The high power coax-to-waveguide coupler employs a T-bar type transition to prevent arcing, while maintaining good bandwidth. A coaxial connector is mounted on the centre-line of the waveguide broad wall with its bare centre pin extending into the guide. The centre pin meets the T-bar, whose diameter steps down toward the waveguide walls. The rule of thumb for a good transition, is achieving a transmission coefficient of better than -0.1 dB across the band. 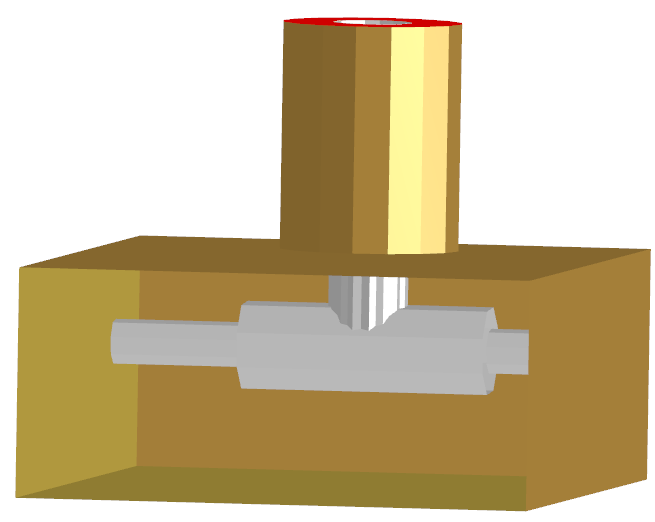 This particular design typically achieves that across the simulated 40% bandwidth, depending on the choice of waveguide dimensions. Custom waveguide dimensions may be specified as part of the design objectives. Typical reflection (S11) and transmission (S21) performance of the device.